SALT LAKE CITY (AP) — Gonzaga forward Killian Tillie returned from a foot injury in January, only to injure it again. The Zags were a bit more aggressive with Tillie’s rehab the second time around and it seems to have paid off. Playing fast and free, Tillie was superb in top-seeded Gonzaga’s blowout win over Fairleigh Dickinson on Thursday night in the NCAA Tournament’s West Region. The 6-foot-10 Frenchman scored 17 points on 7-of-8 shooting in the Zags’ opener and proved he’s feeling good with a dunk over two Fairleigh Dickinson defenders that brought his teammates to their feet. Gonzaga (31-3) is going to need that pop in its second-round game against Baylor on Saturday. The Zags faced a tired and overmatched team in Fairleigh Dickinson, which had a short turnaround after winning its First Four game in Dayton on Tuesday. Gonzaga jumped on the Knights from the start and had the game pretty much out of reach long before halftime in the 87-49 victory. Baylor (20-13) will be a much bigger challenge, on both ends of the court. The ninth-seeded Bears shot their way over and past Syracuse’s vaunted zone in their opener, hitting a school NCAA Tournament-record 16 3-pointers in the 79-68 win. Baylor had a few lapses defensively against the Orange, but plays a 1-3-1 zone that’s difficult to prepare for, particularly with the quick turnaround that comes with playing in the NCAA Tournament. A big part of Baylor’s defensive scheme will revolve around stopping Gonzaga forward Rui Hachimura. The Zags have plenty of weapons, but the Japanese big man is the most dangerous. 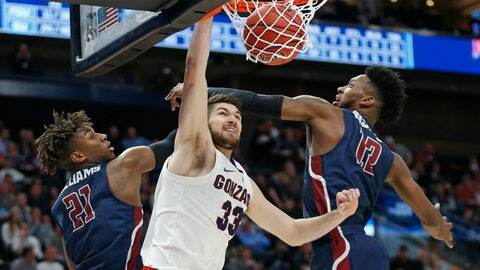 Able to play in the post, beat defenders off the dribble or knock down shots with his superb mid-range game, Hachimura leads Gonzaga with 20.1 points per game and shoots 61 percent. He’s also a 47 percent shooter from 3-point range. Hachimura had 21 points and eight rebounds against Fairleigh Dickinson. The fourth-seeded Seminoles will face the 12th-seeded Racers in Hartford for a spot in the West Regional in Anaheim, California. Michigan is looking to reach the Sweet 16 for a third straight year. First, the Wolverines must figure out how to attack Florida’s flummoxing defense. The second-seeded Wolverines (29-6) rolled to a 74-55 win over Montana in the first round Thursday, with Charles Matthews scoring 22 points in his best outing since returning four games ago from an ankle injury. Getting Matthews close to full health helps because Michigan’s offense has been up and down in March. Though the Wolverines won their NCAA opener easily, they committed 14 turnovers and shot just 29 percent on 3-pointers. Florida (20-15) has the Southeastern Conference’s top defense, and it gave offensive-minded Nevada fits in the first half of the Gators‘ 70-61 first-round win. Nevada was able to force the action in the second half and whittled down an 18-point lead to two before the Gators pulled away late. White’s main concern, as it was against Nevada, is dealing with the opponent’s size. Kevarrius Hayes, at 6-foot-9, is Florida’s biggest starter. No one else is over 6-6. Michigan center Jon Teske is 7-1 and 260 pounds, and Ignas Brazdeikis and Isaiah Livers are 6-7 and solid. A reporter brought the late-night comedian’s bit about whether the Spokane, Washington, campus is for real straight to coach Mark Few on Friday. On a recent show, Kimmel called March Madness the time of year that brings together “63 real (teams) and one from a made-up college called Gonzaga. It’s like eggnog. You hear about it once a year, then for 50 weeks, it disappears,” Kimmel said. Because it’s nowhere near a major media market, and because its enrollment is only around 5,200, Gonzaga is, in fact, easy to miss. But Few batted down any conspiracy theory. “As long as they are talking about Gonzaga and the program, I think that’s probably a really, really good thing,” Few said.